On Saturday, August 9, a small group gathered in the Lincoln Community Foundation Gardens to celebrate a remarkable champion for children in foster care. 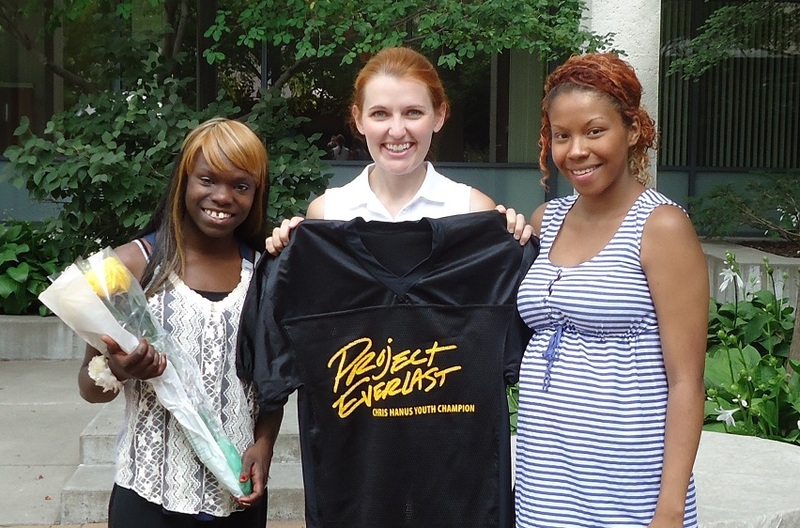 The youth of Project Everlast Lincoln chose to honor Senator Amanda McGill with the annual Chris Hanus Award. Senator McGill introduced LB 216 in the 2013 Legislative session, asking for the state to provide better, more age-appropriate support for young people aging out of foster care. The resulting program is Bridge to Independence, which has just been approved by the federal government and will go into effect in just a few weeks. The young people of Project Everlast Lincoln felt that Senator McGill went above and beyond in championing their cause and helping to ensure that more young people will age out of foster care with the support they need to transition successfully to adulthood. The Chris Hanus Advocate of the Year award was created in 2013 to honor professionals going above and beyond in the service of youth in and from foster care, as the award’s namesake did. Recipients are selected by a group of youth with current and former foster care experience from across the state. Youth-created awards are given at events selected and planned by youth in the area where the recipient serves. Other 2014 awardees include Judy Dierkhising ofProject Everlast in Omaha and CASA Pat Gromac by the Fremont council.